Resin Driveway Virginia Water by PC Landscapes. Having successfully won the tender to construct this garden, we were also asked to reshape the driveway in Virginia Water. We installed a new set of automated gates, along with drive lights and new resin driveway surfacing. We used a resin-bound permeable aggregate with sandstone setts to edge the drive. The project also included, new planting, installation of new curved sandstone steps, plus a new irrigation and full lighting system. 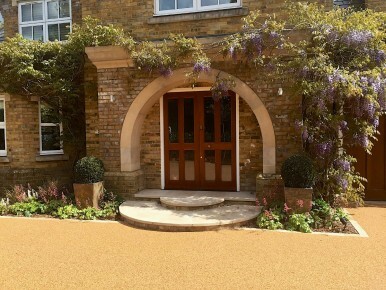 Our bespoke resin driveways are available in a variety of colours and styles. All installed by our professional team of landscape gardeners. The perfect clean, hard wearing solution to any make drive look amazing. It doesn’t stop there. These driveways are constructed in a way that allows water to filter through to the ground beneath which is great for the environment, and great for you.